Freedom™ is a powerful, tightly integrated suite of over 30 modules and tools that requires very little technical skill to maintain. You have control over what features you choose to give to your visitors, and you can determine which features you want to control or let your staff control. Freedom™ web empowerment software provides all the tools you need to create, build, and manage a content-rich, fully interactive website. Transform your business by capitalizing on the full commercial power of the web with a powerful, affordable solution that makes it easy to develop websites, publish information from multiple contributors, streamline workflow and maintain a consistent look and feel with an easy-to-use content management solution. Rapidly design, develop, and launch your website, convert an existing website or let our innovative design team create a whole new look for you. Provide dynamic content and interactive online services. Communicate by engaging customers, partners, suppliers, and employees. Market, promote and increase traffic to your site, drive business, generate leads. Implement an online storefront to sell products or offer online literature fulfillment. Automate business processes and free staff and IT resources for core business. Track, measure and monitor the effectiveness of your online strategy. Take control of your most valuable asset by managing organizational knowledge and intelligence. Manage your own site to free IT resources. Protect your site and the integrity of your data. 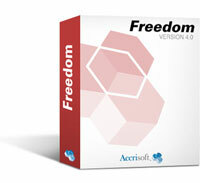 Our Freedom software platform is a unique product in the content management marketplace. It can be used by just about any type of company or organization, regardless of size or business segment. The Freedom software suite is 100% market-driven, which means that our customers tell us what features and modules to build. Freedom Websites always have the benefit of the latest releases. Pick and choose from over 30 powerful modules with more being developed every day.